Most of us take our five senses for granted. Two vital senses are the ability to see clearly and hear clearly. They help us to learn, develop relationships, enjoy nature, participate in sports, and appreciate music and arts. Growing up wearing glasses or contact lenses, we may not think much about them until we are ready to start a career. We may not consider hearing or vision impairments to be serious, but they can be a challenge depending on the type of career path you choose. Your vision and/or hearing can become an impairment to securing the job of your dreams. 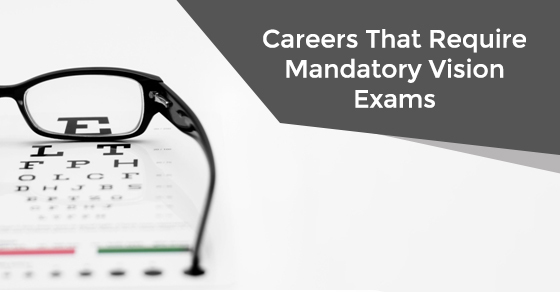 Let’s look at some careers that require mandatory vision examinations. First responders top the list. This honorable profession requires many abilities especially good vision. Firefighters encounter smoke, heat, water, and many times must work in darkness. Having good vision can be the difference between life and death in certain situations. Ontario has province wide rules for vision evaluations before hiring can take place. Vision screening is required to determine medical conditions that may interfere with essential job tasks. According to the Ontario Firefighter Services, a candidate who has had laser vision correction is eligible to become a firefighter. The brave women and men in blue who keep us safe have minimum requirements and specific vision standards they must meet in order to become officers. You must have an eye exam to test colour, depth perceptions, peripheral vision with a visual acuity (VA) of 20/40 and best corrected visual acuity of 20/30 with both eyes. If you have always wanted to be a pilot, you must have good vision. If you’re a traveler that flies often, you will be pleased to know they too must meet certain standards. Pilots encounter low visibility conditions, blind spots, and operate with few (if any) visual references. They must be able to see the controls and in the distance. The same requirements apply to flight engineers as well. Commercial drivers are held to higher standards than a regular driver. As part of their job, they drive long distances over longer periods of time and so there are more physical demands on a truck driver. Their visual test results must not be poorer than 20/30 and no poorer than 20/100 in the weaker eye. These are just a small representation of the many careers that require good vision and another reason why maintaining eye health with regular eye exams is important. and of course laser vision correction.